“Sir! Yes, Sir!” was the appropriate response. This was based upon the recognition that diabetes is characterized by high blood sugars, even though this was not the underlying cause of the disease. High blood sugars are the symptom of the disease, not the actual disease itself. In type 1 diabetes, the lack of insulin was the primary cause of disease, so clearly the replacement of insulin is a cornerstone of management. In T2D however, high insulin resistance is the primary cause of disease. Therefore, logic dictates that treatment should be directed towards reversing insulin resistance rather than the symptom of high blood sugar. Further, being predominantly a dietary disease, it would seem only rational that the cure be dietary rather pharmaceutical. Nevertheless, the nexus of types 1 and 2 diabetes was the occurrence of high blood sugars. So, borrowing heavily from the type 1 playbook, insulin is increasingly used for type 2 diabetes as well. Over the last decade, the number of insulin using patients rose 50%, and almost 1/3 of patients with diabetes overall in the United States use insulin. This is slightly horrifying, considering that 90-95% of diabetes in the United States is T2D, where the use of insulin is highly questionable for the reasons given above. In 2011, according to the CDC, 85.3% of patients were using medications or insulin for their diabetes. Large scale trials had shown that tight blood sugar control was largely useless in preventing cardiovascular disease. After all, it doesn’t quite make sense to give more insulin to a patient with a disease that has too much insulin already. That’s kind of like washing clothes by putting them in water and drying clothes by also… putting them in water. T1D and T2D are kind of opposites since once has too little insulin and the other has too much. How on earth did we expect that they should be treated exactly the same? Are we idiots? Up until the mid 1990s, it was not clear that high blood sugars were dangerous. In the short term, low blood sugars are far more dangerous. Severe hypoglycaemia is strongly associated with a wide range of adverse outcomes, including heart disease and death. A 2014 study in JAMA Internal Medicine looked at the incidence of hypoglycaemia. Nearly 100,000 emergency room visits and 30,000 admissions to hospital are directly related to hypoglycaemia. Over 5 years, the estimated cost of this care is $600 million. Older patients generally are at higher risk. From 1999-2011, an estimated 404,000 patients were hospitalized for low blood sugars compared to an estimated 280,000 hospitalized for high blood sugars. The sequelae may be serious – seizures, loss of consciousness, and even death. Things changed in 1993 with the publication of the DCCT (Diabetes Control and Complications Trial) in the NEJM. 1441 patients with type 1 diabetes were randomized to either tight glucose control (3-4 daily injections), or conventional (1-2 daily injections) control. The higher dose of insulin successfully lowered the average blood sugar. 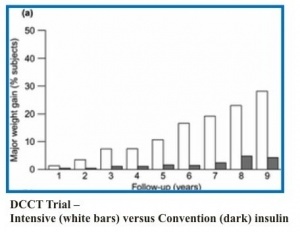 The A1C was approximately 7% in the tight control group and close to 9% in the conventional group. By today’s standards, an A1C or 9% is considered well out-of-control. The incidence of hypoglycaemia, as might be expected was 3 times higher in the intensive control group. Over 6.5 years of follow up, the incidence of retinopathy decreased by 76%. Diabetic nephropathy (kidney disease) decreased by 50%, and nerve damage reduced by 60%. The trial was not quite long enough to assess the effects of tight blood sugar control on macro vascular disease (heart attacks and strokes). There was no beneficial effect at the end of the trial, but whether any benefit would come from longer follow up was unknown. So, these patients were followed for longer in the EDIC (Epidemiology of Diabetes Interventions and Complications) trial published in 2005 in the NEJM. This followed the same group of patients up to an average of 17 years. These groups were not actively treated, but only followed, so both groups had similar blood glucose control from years 6.5 to 17. The mean A1c was 7.8-7.9%. This was long enough to detect any changes in CVD, which was reduce by approximately 50%. This clearly established the paradigm of glucotoxicity in T1D. Remember that T1D is characterized by a lack of insulin. Giving enough insulin to control blood sugars in this disease provided substantial reductions in the complications of diabetes. This meant that much of the toxicity in T1D could be attributed to the effect of the high blood sugar. There was a cost, however. There were increased hypoglycaemic episodes as noted above. Further, the incidence of substantial weight gain was increased significantly in the intensive group. Almost 30% of subjects in the higher dose insulin group developed ‘major weight gain’, far in excess of what was seen in the conventional group. However, there was no denying the benefits. However, by the late 1990s, there was some inkling of concern amongst some physicians about the excessive weight gain. The group with most weight gain (defined by the first quartile, or top 25% of weight gainers) increased their Body Mass Index from 24 to 31 during the treatment period. In other words, they went from a normal weight to obese in an effort to reduce blood sugars. Blood pressure and blood cholesterol were also adversely affected. The other problem was that the weight gained tended to be in the abdominal area. The combination of central adiposity, hypertension and dyslipidemia is a hallmark of the metabolic syndrome that is more typical of type 2 diabetes, characterized by insulin excess. This could not be good news. But there was worse to come. Looking at the EDIC study, researchers once again questioned whether this excessive weight gain had detrimental effects. Subjects in the EDIC study, after 17 years of insulin treatment had their coronary artery calcification (CAC) scores and carotid intimal medial thickness (CIMT) measured. Both are well accepted measures of atherosclerosis – the buildup of plaque in the artery that leads to heart attacks and strokes. High levels of calcification and thickened blood vessel walls were a sign of bad things to come. CIMT was measured at year 1 and year 6. CAC was measured at year 8 of EDIC or 11-20 years after the start of the trial. With the longer follow up of the EDIC study, patients continued to gain weight, continued to increase their waist circumference, and continued to require higher and higher doses of insulin. Those who gained the most weight also had worse blood pressures and lipid parameters. Even more ominous, CIMT scores and CAC scores also increased in this excessive weight gain group. What this means is that, we can demonstrate reduction in glucose toxicity in T1D with intensive treatment, but there is a good chance that we are seeing, in the long term, toxicity from the insulin treatment as well. The well-known propensity of insulin to cause weight gain is not some trivial problem of trying to fit into your swimsuit. It has deleterious consequences. Insulin causes obesity. Along with that obesity, you get metabolic syndrome (lipid problems, central obesity, and high blood pressure). Worse, you start seeing subclinical markers of atherosclerosis (CAC and CIMT). So there are really two types of toxicity here. There is toxicity from the high blood sugars, but also long term toxicity of the high insulin doses which leads to obesity. In T1D, you start off with very low insulin so the dominant problem in the short term (<10 years) is glucose toxicity. However, as you take high doses of insulin longer and longer, you start seeing some of the same problems you get with T2D – a problem of too much insulin. The problem was that this problem of insulin toxicity was not considered until very recently. The DCCT/ EDIC trial seemed to confirm only the glucotoxicity and that’s what doctors focused on. All the bad effects of diabetes both types 1 and 2 were considered to be a result of the high blood sugars. Under this paradigm, then, blood sugars must be lowered at all costs – even if it means sledgehammering somebody with hundreds of units of insulin. The big insulin makers, of course, were only too happy to fund this research. Whether this applied to type 2 diabetes was a good question. T2D is a disease of too much insulin resistance leading to high blood sugars. It is not immediately obvious that hammering somebody with more insulin is a great idea. After all, patients with T2D have high, not low insulin. But the prevailing mantra was lowering blood sugars. The UKPDS study would begin to shed some light. Thank you for this information. I have been wondering if the toxicities do DM come from insulin or elevated blood glucose. It seems like it is a bit of both. This makes it more imperative that we treat type II DM at least with diet rather than with more and more drugs. Dr Fung … if you reverse 10 (or 20 years) of high insulin resistance … and re-achieve your healthy weight (and waist to height of approximately 0.5) … can you reverse the effects to your arteries and such therefore lowering your chance of stroke and heart attack’s? I too would be interested in finding this answer re: artery plaque buildup? Yes arterial plaque can be reversed. Through vitamin therapy. There are several vitamin K therapies using K2, and various other vitamins, namely D. Not done properly you will increase the plaque as was my case. 2 grams vitamin C (as ascorbic acid), 1 gram lysine, and 500 milligrams proline, every 4 hours, 5 times a day. It is supposed to clear your arteries out in as little as a month to up to a year depending on how plugged up you are. Even I am really keen to know. Would please someone reply? If diet and fasting reverses or even cures 10 to 20 years of insulin based T2D , would that reverse the CAC? Can the damage be undone? So they turned T1 patients into T2 patients by disregarding diet (or giving flawed diet advice) and just chasing blood glucose levels with more and more insulin, instead of prescribing a low carb diet. Brilliant. Way to go, they killed a bunch of people. Par for the course. Dr. Fung, when you say 24 hour fast do you mean for example from dinner to dinner or do you mean all day for example go to bed Sunday and fast on Monday and eat again on Tuesday. I found a few places where the meaning of 24 hours could of meant both and it confused me. When I do 24 hours, it’s dinner-to-dinner. I think that’s best, since you don’t have to go to bed hungry and get most of the fasting time done within your daily schedule. Sunday night to Monday night would be 24 hours to tuesday morning would be 36 hours, remember while you are asleep is also counted as time spent fasting. just a guess that you’ll do ok to just stick with your program. you are adjusting to the reduction of medication. once you’re adjusted you will resume your progress. Is it possible to find a dr in my area that can help me with an intermittent fasting regimen and with montoring insulin injections ? I started the book and have seen some you tube videos obvoisly geared toward doctors.